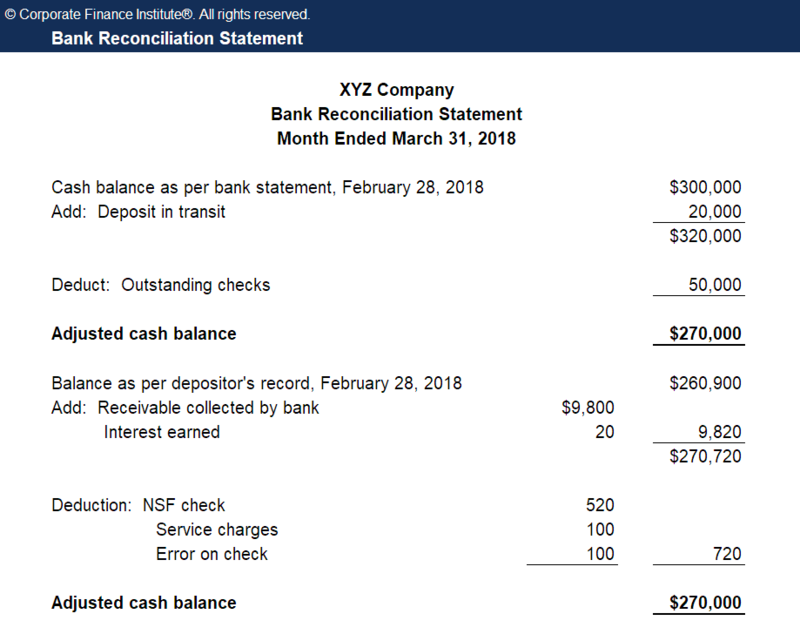 A bank reconciliation statement is a document that matches the cash balance on a company’s balance sheetBalance SheetThe balance sheet is one of the three fundamental financial statements. These statements are key to both financial modeling and accounting. The balance sheet displays the company’s total assets, and how these assets are financed, through either debt or equity. Assets = Liabilities + Equity to the corresponding amount on its bank statement. Reconciling the two accounts helps determine if accounting changes are needed. Bank reconciliations are completed at regular intervals to ensure that the company’s cash records are correct. They also help detect fraudTop Accounting ScandalsThe last two decades saw some of the worst accounting scandals in history. Billions of dollars were lost as a result of these financial disasters. In this article, we look at the 10 biggest accounting scandals in recent times. Many of these scandals were a result of the excessive greed of the and any cash manipulations. Deposits in transit: Cash and checks that have been received and recorded but have not yet been recorded on the bank statement. Outstanding checks: Checks that have been issued by the company to creditors but the payments have not yet been processed. Bank service fees: Banks deduct charges for services they provide to customers but these amounts are usually not noticeable. Interest income: Banks pay interest on some bank accounts. Not sufficient funds (NSF) checks: When a customer deposits a check into an account but the account of the issuer of the check has insufficient amount to pay the check, the bank reduces from the customer’s account the check that was previously credited. The check is then returned to the depositor as an NSF check. Nowadays, many companies use specialized accounting software in bank reconciliation to reduce the amount of work and adjustments required and allow real-time updates. 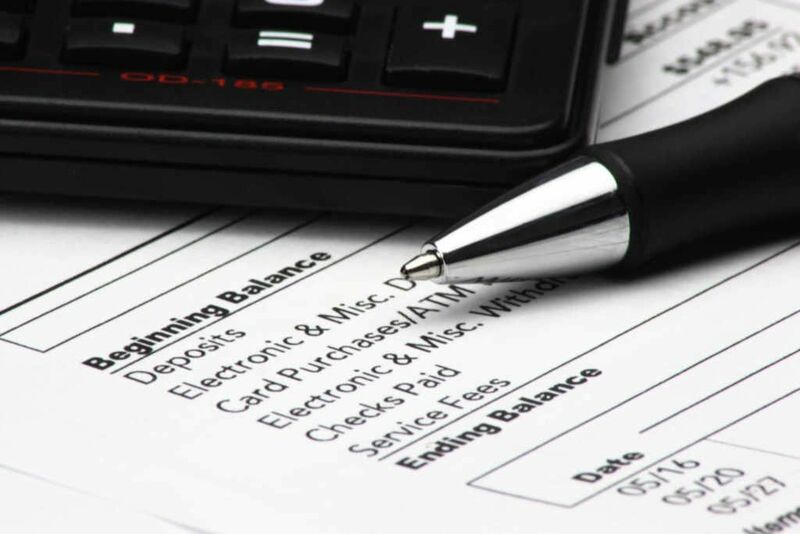 On the bank statement, compare the company’s list of issued checks and deposits to the checks shown on the statement to identify uncleared checks and deposits in transit. Using the cash balance shown on the bank statement, add back any deposits in transit. This will provide the adjusted bank cash balance. Next, use the company’s ending cash balance, add any interest earned and notes receivable amount. Deduct any bank service fees, penalties, and NSF checks. This will arrive at the adjusted company cash balance. After reconciliation, the adjusted bank balance should match with the company’s ending adjusted cash balance. A check for the amount of $470 issued to the office supplier was misreported in the cash payments journal as $370. A note receivable of $9,800 was collected by the bank. A check of $520 deposited by the company has been charged back as NSF. After recording the journal entries for the company’s book adjustments, a bank reconciliation statement should be produced to reflect all the changes to cash balances for each month. This statement will be used by auditors to perform the company’s year-end auditing. CFI is the official provider of the global Financial Modeling & Valuation Analyst (FMVA)™FMVA™ CertificationThe Financial Modeling & Valueation Analyst (FMVA)™ accreditation is a global standard for financial analysts that covers finance, accounting, financial modeling, valuation, budgeting, forecasting, presentations, and strategy. certification program, designed to help anyone become a world-class financial analyst. Through financial modeling courses, training, and exercises, anyone in the world can become a great analyst. Financial Statement NormalizationNormalizationFinancial statements normalization involves adjusting non-recurring expenses or revenues so that it only reflects the usual transactions of a company. Financial statements often contain expenses that do not constitute the normal business operations and that may hurt the company’s earnings.